People, it's Thanksgiving time. Turkey and mashed potatoes and yams galore, brussels sprouts and cranberry sauce, and of course, you can never have enough pie. Except you know what? I'll beg to differ. I'm a pie lover like the best of 'em, but at a certain point, I need a break. I want a crumble, a crisp, perhaps some bars. Thanksgiving may be about tradition, but it needn't resist a change of pace, right? With the big day under a month away, I know you're all on the hunt for the best Thanksgiving recipes. As it turns out, we're off to the in-laws, so I won't be cooking. Don't worry, though - I won't be leaving you stranded. Y'all know there's that crazy part of me that can't bear the thought of missing Thanksgiving prep - it's a weird sort of FOMO reserved for food bloggers. So here I am, with not an ounce of turkey to cook and not a pie to bake, still coming at you with recipes and menus to make your holiday memorable. First up are these bourbon pecan bars. But I've got more up my sleeve, so stay tuned. *Note: Martha says this recipe makes 24 bars. She has you bake them in an 8x8. But I tend to like a thinner bar, with a texture more like shortbread, so I spread the recipe out in a 9x13. 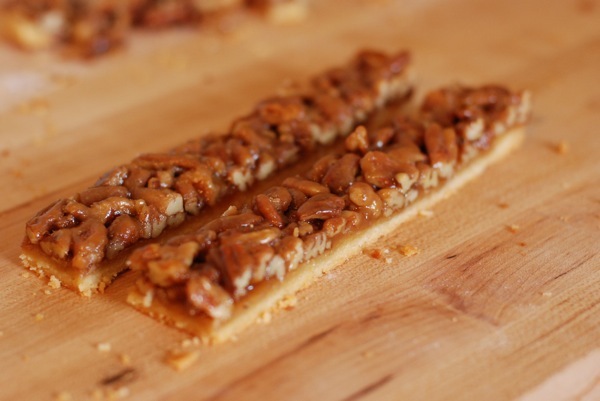 If you like thicker bars, bake in an 8x8 or double the recipe. Make crust: Preheat oven to 375 degrees. Line a 9x13-inch baking pan with foil. In a food processor, pulse flour, sugar, and salt to combine. Add butter; pulse until mixture resembles coarse meal. Add egg; pulse just until a dough forms. Transfer dough to prepared pan; with floured fingers and/or an offset spatula, press firmly into bottom of the pan in a single, uniform layer. Freeze until firm, about 15 minutes. Prick bottom of dough; bake until lightly golden, 22 to 25 minutes. Let cool while preparing filling. Make the filling: In a large saucepan, bring butter, brown sugar, and corn syrup to a boil over high heat, whisking constantly, until smooth; continue boiling, without stirring, until slightly darkened, about 2 minutes. Remove pan from heat. Whisk in cream, bourbon, and salt; mix in pecans. Assemble and bake: Spoon hot filling evenly over crust, using spoon to arrange and press in nuts so they fit snugly (create as flat a surface as possible). Bake until bubbling and amber-colored, 18 to 22 minutes. Cool completely in pan. Using foil, lift cake from pan; peel off foil. With a sharp knife, trim edges (if desired). Cut crosswise into 8 even strips; cut each strip into 6 even rectangles to make 48 bars.